Admission: Tickets from £8.80 – £39.60. The Natural History Museum ice rink in Kensington, London has returned once again this year for more skating fun to be enjoyed by young and old. The doors to the popular Christmas attraction opened on 6 October this year and remain a firm family favourite until 7 January 2018. Located in front of the Waterhouse building, the ice rink at the Natural History Museum is one of the most magical places to be this winter. For those who are new to the experience of ice skating, we have three simple rules to get you up on your feet in no time. Firstly, always take it slow. There’s no rush and you will be among other new-comers who are all keen to learn. Secondly, try to keep your knees bent when skating. By doing this you will ensure that your knees are not locked, resulting in more control as you glide along the ice. Lastly, have fun. This is one of the best times of year and is truly a wonderful way to experience Christmas cheer. Advance bookings are advised in order to guarantee a chance to hit the ice. Limited tickets are available on the day from the box office and at peak times there may be long delays before you get a chance to skate. 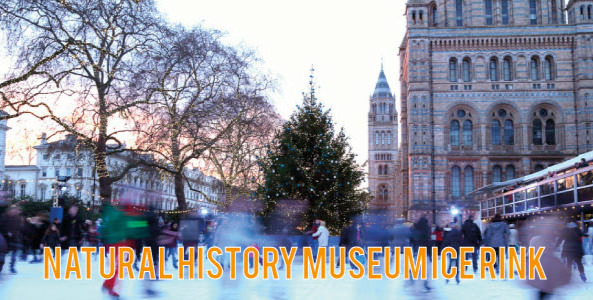 Ice skating at the Natural History Museum ice rink is a ton of fun and the perfect way to start your Christmas celebrations. As you can imagine, this event is very popular and tickets are selling out fast. If you to visit our capital city, please plan ahead. Accommodation at this time of year is in high demand. B+B Belgravia is perfectly located with quick access routes to all the Christmas festivities. Contact us today to arrange your booking. Telephone +44 (0) 20 7259 8570 or email: info@bb-belgravia.com. We hope to see you soon.